Shikakai cleanse and condition your hair at the same time. It is mild enough to be used frequently and on all types of hair. Shampoo that we offer are available in several size packs. These are widely used for cleaning Hair as well strengthening the hairs. These are renowned for healthy hair product and are widely demanded throughout the world. These provide excellent shine, removes allergies and dandruffs from hairs and easy to comb. We offer these Henna Shampoo packs in excellent packaging. Packaging Size: 210 ml / 7.10 fl oz. - D'vine's Anti-Hair Fall Shampoo helps in caring your hair and make it soft and thick. 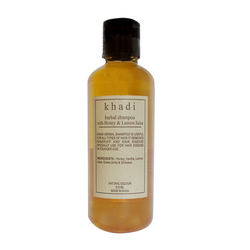 Its kindly suggested that use of khadi herbal shampoos make your hair healthy and gives thicker appearance. KHADI Neem Reetha Herbal Shampoo with Conditioner with almond oil Neem and aloe-Vera are natural Conditioners and antiseptics They protect the hair from dandruff, dryness and split Ends. Directions: Wet Hair Lather Dandruff, Dryness and split ends. 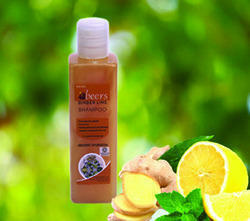 A shampoo for all hair types, this natural cleanser is formulated to remove the daily build-up of harmful scaling. This hair care product is used for the removal of oil, dust, dead skin, dandruff, environmental pollutants and other contaminant products that gradually build up on you scalp. Khadi Herbal Shampoo Prepared For All Types Of Hair. Khadi Herbal Shampoo Prepared For All Types Of Hair. Makes Hair Healthy, Silky, Shiny And Natural Black. Instruction of use :Wet hair, take shampoo according to hair length, massage all over scalp & entire hair length. Rinse off.